The cost of buying Congress and the White House has gone way up in the first three months of Republican rule. Companies spent nearly $840 million on lobbying in the first quarter of 2017 — the highest amount in five years, according to calculations by the Center for Responsive Politics based on data from the Senate Office of Public Records. The number of registered lobbyists dropped by 10.3 percent in the first quarter, compared to the same period in 2016 to 9,175 on record. But let’s stay with the money for a moment. 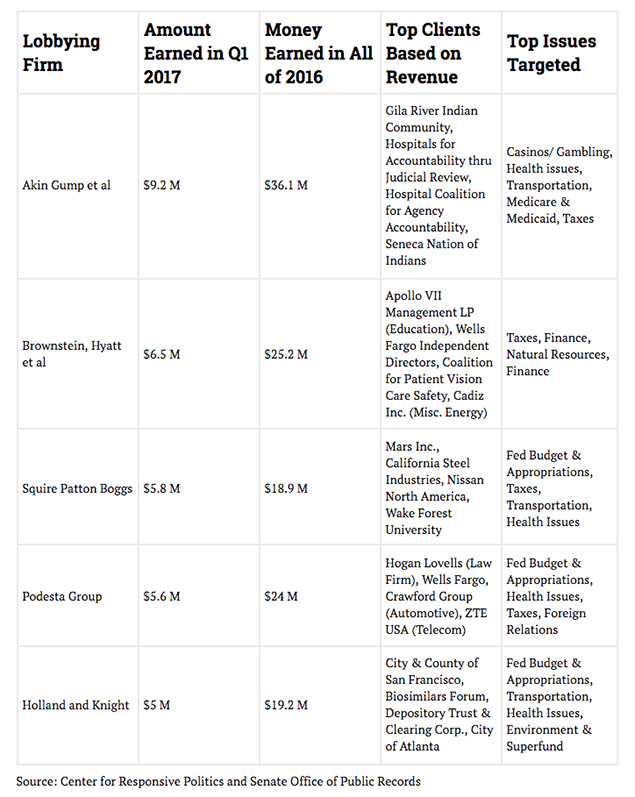 Leading the pack was Big Pharma and the health products sector (a combined sector), which poured just shy of $80 million into lobbying efforts in the first quarter, an increase of $10 million or 14 percent over the same period last year. Next in line was the insurance sector, which spent $40.2 million, showing an increase of 3.6 percent — no doubt in an effort to sway any changes to the Affordable Care Act. The oil and gas sector pumped $36 million into lobbying for an 11 percent increase over first quarter 2016, looking to make gains in drilling efforts and lighten regulations. Chevron, in particular, increased its lobbying efforts by a whopping 77 percent to $3.3 million, compared to last year. Another noteworthy individual organization this quarter was the National Rifle Association (NRA), which tripled the amount spent on lobbying this quarter over last year, at $2.2 million. In fact, this marks the first time the gun enthusiast has ever spent in the seven digits in a quarter on lobbying efforts. It’s a little odd, this spike in spending, considering the NRA is not up against an administration pushing for stronger gun controls, as it had for the past eight years. But it illustrates a potentially pivotal moment in lobbying; groups are now spending money to lobby offensively on the issues instead of defensively. “For the first time in the past five years, there is a lot of energy in Washington in terms of getting legislation passed,” Caleb Burns, a partner at Wiley Rein LLP, said in an article by the Center for Responsive Politics. “Lobbying up until this quarter has been defensive, oftentimes to ensure that nothing did happen. I’ve never seen the business community this excited in the two decades I’ve been in Washington.” Wiley Rein earned $3.7 million last year and $990,000 in the first quarter. Its top clients include steel manufacturer Nucor Corp. and AT&T Inc. So, though there’s been a thinning of the roster of lobbyists, the game is going strong. And despite Trump’s tough talk on lobbyists, he’s let quite a few of them in through the back doors of the White House and federal agencies. For example, Michael Catanzaro, who serves as the top White House energy adviser, was until late last year a lobbyist for major energy clients as they fought the Clean Power Plan. Chad Wolf is another example. He is now chief of staff at the Transportation Security Administration, despite lobbying that agency for the past several years to have it spend hundreds of millions of dollars on a new carry-on luggage screening device. It should come as no surprise that device is now being tested and considered for purchase by TSA staff. Lance Leggitt, Tom Price’s chief of staff at the Department of Health and Human Services, worked as a lobbyist last year for 10 different healthcare companies. And Christian Palich, the former president of the Ohio Coal Association and a former registered lobbyist, has joined the Environmental Protection Agency’s congressional team. The list goes on and on. So, how do so many foxes get away with running the henhouse? In January Trump issued an executive order that did away with former President Barack Obama’s 2009 rule that executive branch appointees not accept jobs in agencies they recently lobbied. Trump also has eliminated the policy of publicly sharing waivers that allow lobbyists in the government to take up matters that could benefit former clients. Previously posted on the Government Ethics Website, none have been posted since Trump took office. Walter M. Shaub Jr., the director of the Office of Government Ethics, has no idea how many waivers have been issued by Trump. Trump’s made it difficult to tell who has visited him by keeping the White House visitor logs private. But don’t fret; Politico has just released a database tracking visitors to the White House in its Unauthorized White House visitor logs.